The Great MM wrote: Being my B-Day in August and getting a TON of OT, I decided to spoil myself extensively this month instead of doing the whole adult thing. 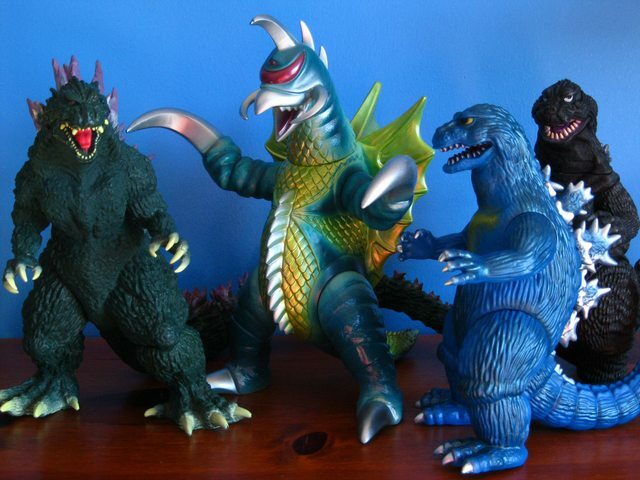 what's that Blue Goji on the left? Maursan 1971 from the GVW line. 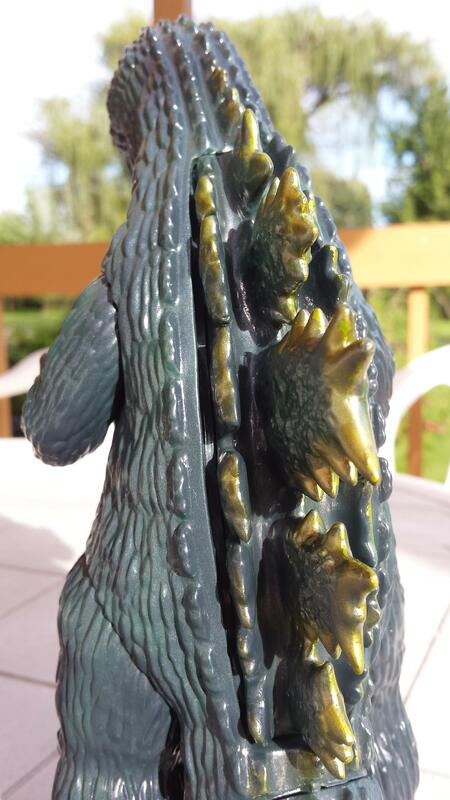 Monsterarts Godzilla '54 arrived today. 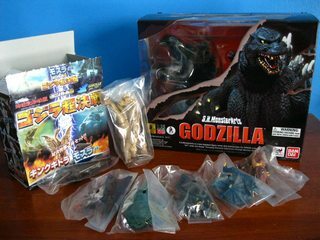 A couple weeks ago I discovered Entertainment Earth had several of their Godzilla figures on sale (they still do! 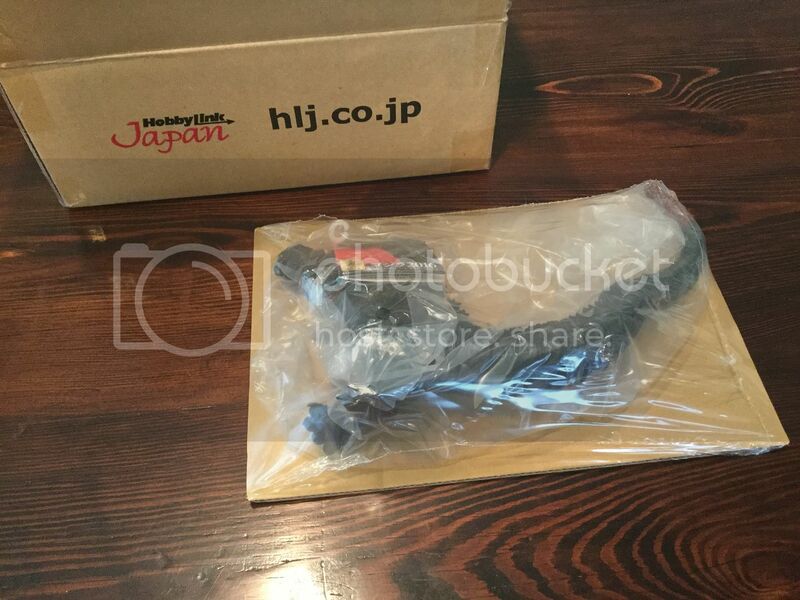 ), so when I saw the figure below listed for roughly thirty-five dollars, I knew I had to act. At last I can join the Marmit appreciation club! despite the stock images, the color scheme looks pretty nice in person: it's sort of a dark sea-green with splotches of blue-gray. 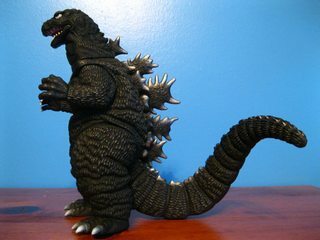 I admit, in the wrong lighting and angle, one might think the figure looks dirty or something; but I think it's a nice, subdued scheme for Goji, and it works extra well with the golden yellow fin highlights. 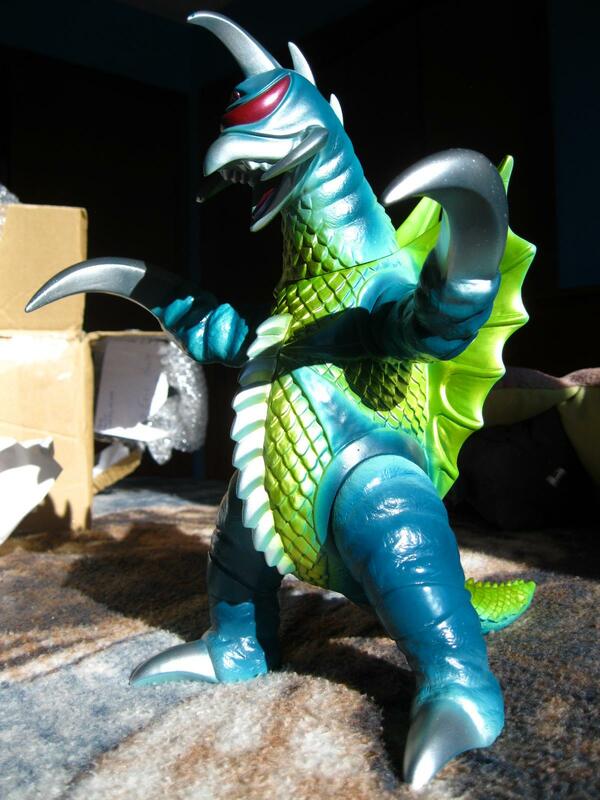 It's my first Marmit, and my first Mosu-Goji; and I'm absolutely delighted to have him. Oh, and he's down to $33.90 now! I'm almost tempted to buy another one!! They're really cool, all three of them. 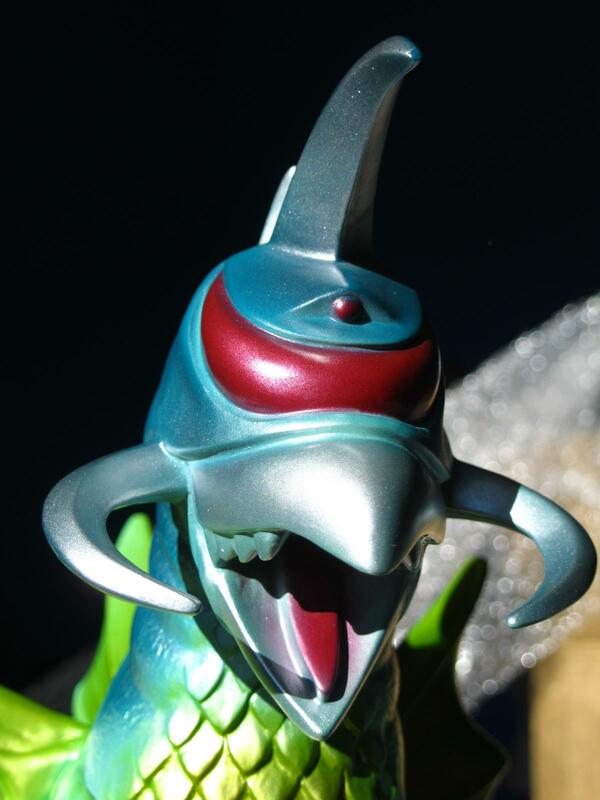 Surprisingly, despite being less than enthusiastic about Heisei designs normally, the '89 has become my favorite. 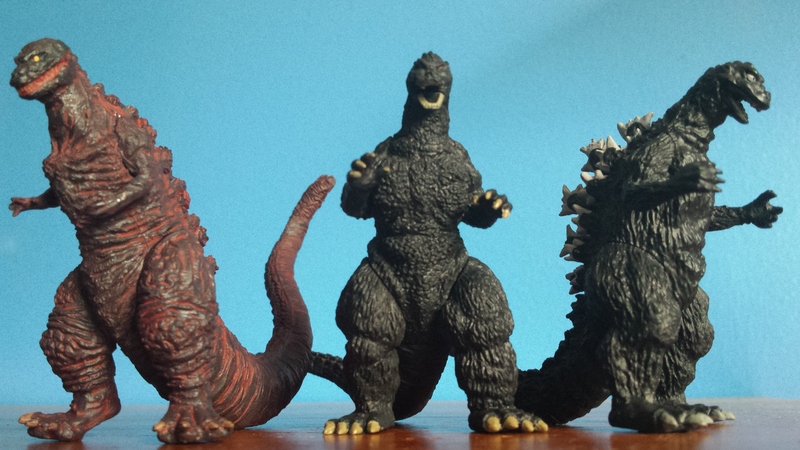 G'14 looks pretty good with them, but those BC minis... Ouch. Last edited by Rody on Thu Dec 01, 2016 11:53 pm, edited 2 times in total. 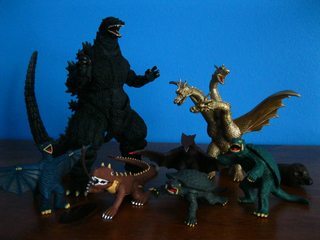 They're splendid figures, the lot of them: four inches tall and hyper detailed. They're kind of sticky, though (in the box too long? 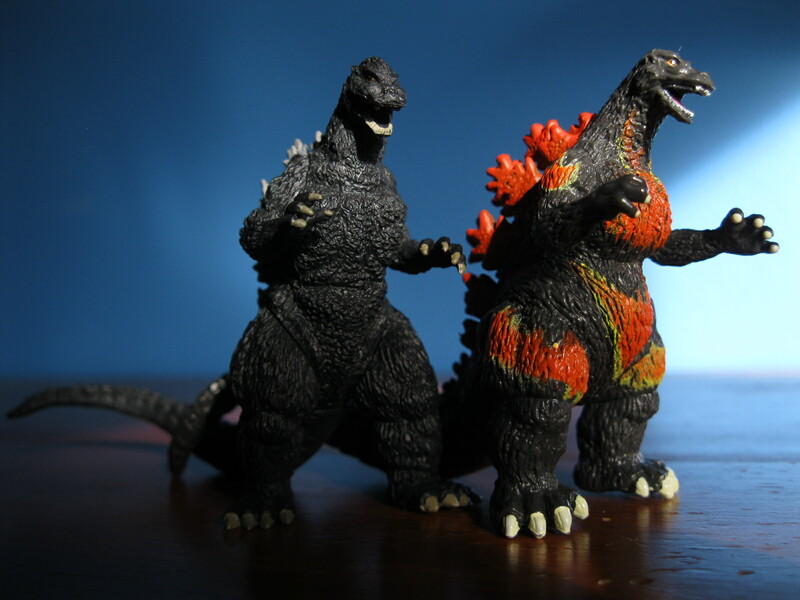 ), and a couple of them want to fall apart. Last edited by Rody on Thu Dec 01, 2016 11:57 pm, edited 2 times in total. 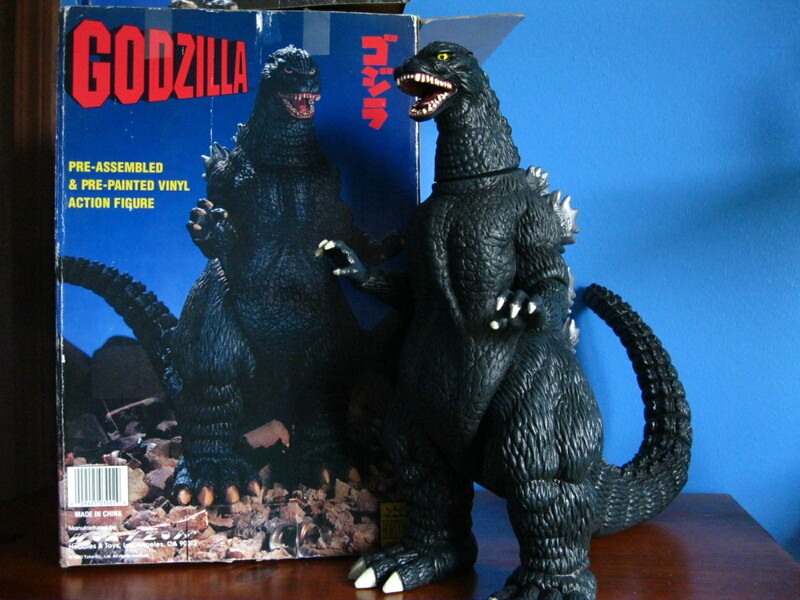 ...And this was passed on to me from my uncle: the Horizon 1993 Godzilla! Last edited by Rody on Thu Dec 01, 2016 11:57 pm, edited 1 time in total. Finally broke down and got these even though the price seems a little steep. 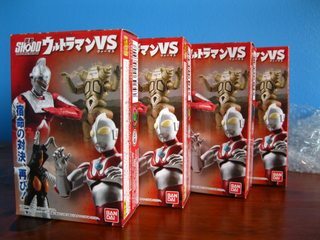 I guess with registered postage from japan $110 for the 3 Bandai, is not that bad. I remember payIng $10 - $15 each for this stuff shortly after being released years ago, now they cost two to three times as much. They must have been really popular. Glad I bought them though. 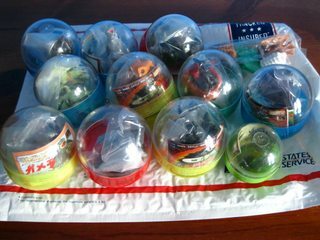 Wish the Banpresto was a regular claw game toy and not a lottary Prize. 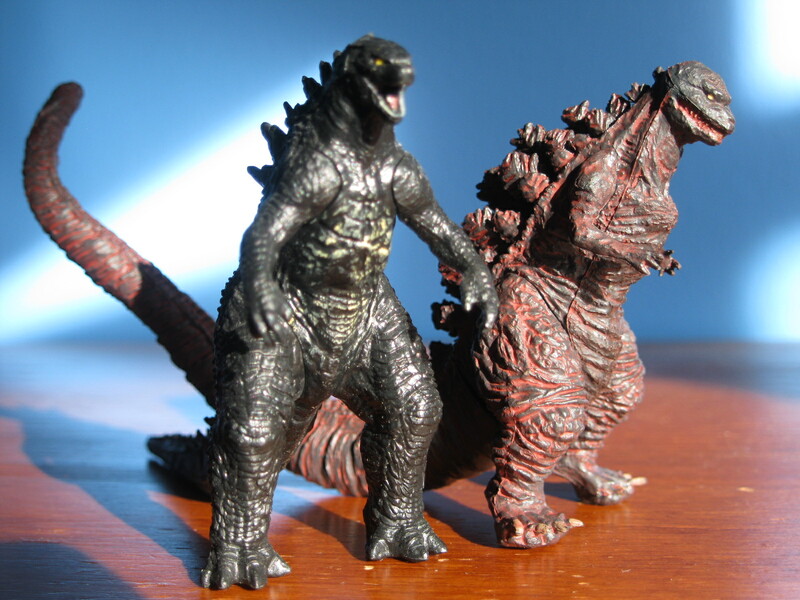 I really want a large version of Shin Goji. The Sega is nice and solid ut so tiny. 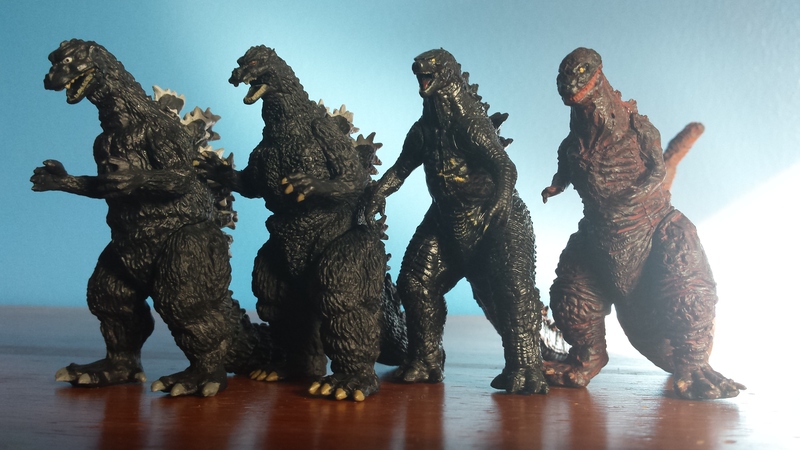 Wishing the bandai were at least 8" scale like the good old days. 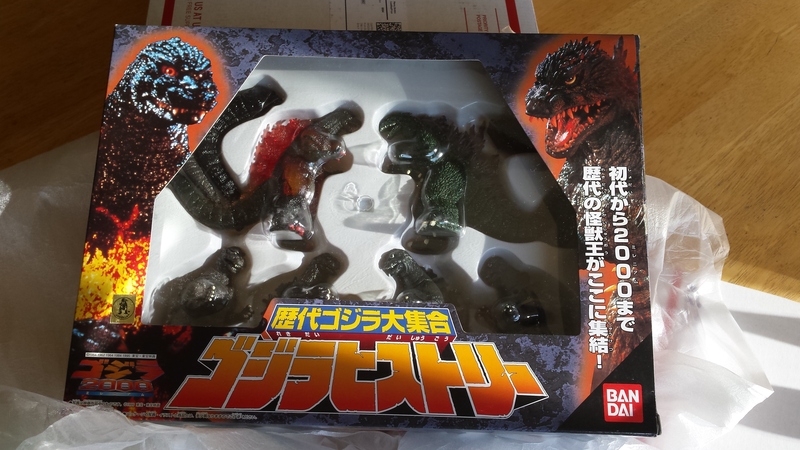 My SHMA BioGoji figure arrived yesterday. 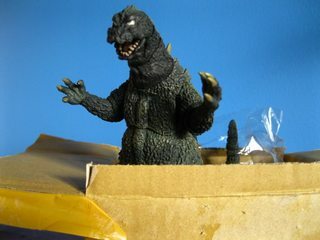 Kiryu wrote: My SHMA BioGoji figure arrived yesterday. What do you think of it? Is it choked up to everything it supposed to be? I collect pretty much everything in the SHMA line, except reissues, and I passed on this. The light up and sound didn't sell me. I have seen some video's and pics but I am still not wow'ed. The sculpt look GREAT though. 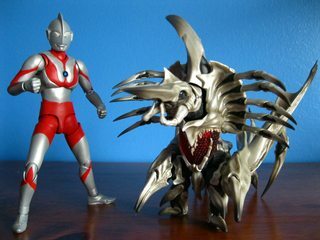 If they made a watered down, in scale with the rest of the SHMA line version, I would pick it up. 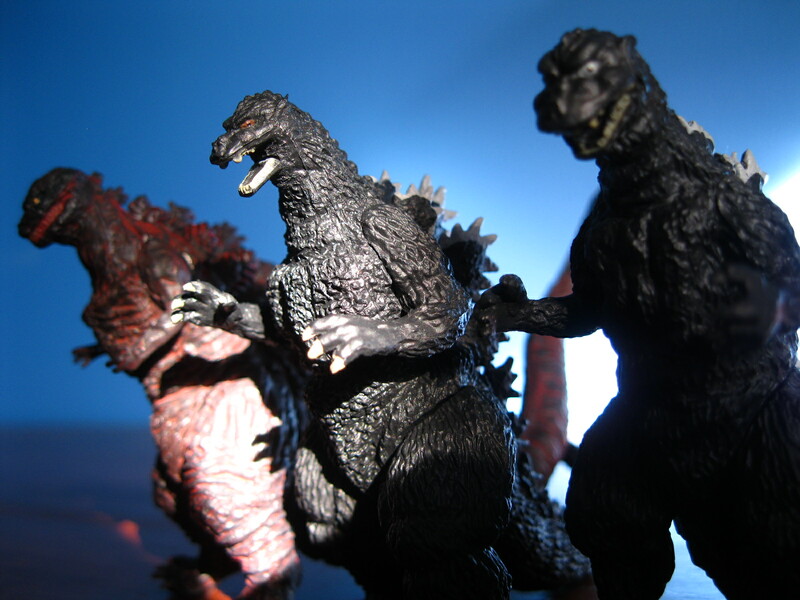 Toho's Godzilla store is open. 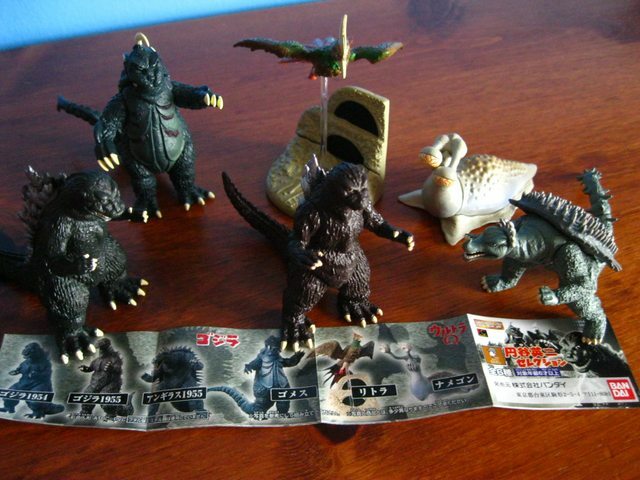 mr.negativity wrote: Toho's Godzilla store is open. Well, crap: "We are sorry to say that we are not able to ship our item internationally at this time so we are not taking any orders from overseas." Overall it's a great figure. The lights are good, but I do notice that the light doesn't extend all the way through the fins. This isn't captured on camera, but you do see it with the naked eye (even in total darkness). 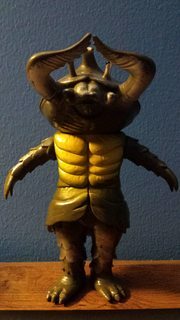 Sculp-wise, it's awesome. 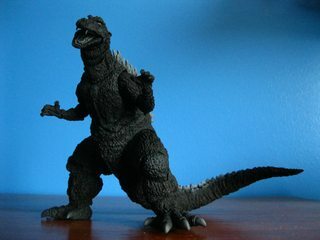 As for articulation, the jaw on mine is very tight until it's open a little bit. The legs don't have that much range of motion either. 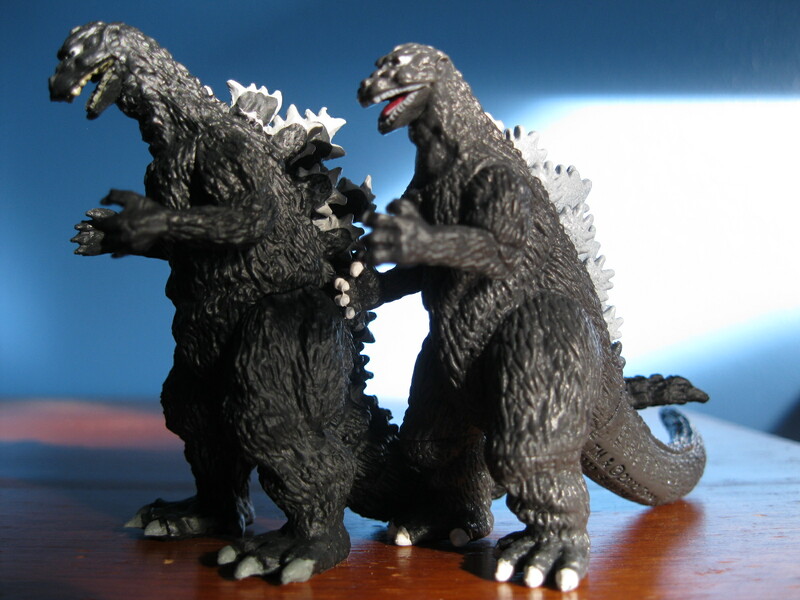 But, Heisei Godzillas are known for not moving their legs side to side that much. Sound is pretty great though. You can tell it's coming from small speakers, but it's good quality small speakers. Awesome. I am still on the fence about this. I have a bunch of light up X-Plus RIC's already so the light up SHMA doesn't really wow me all that much and the audio, while cool, doesn't wow me either. 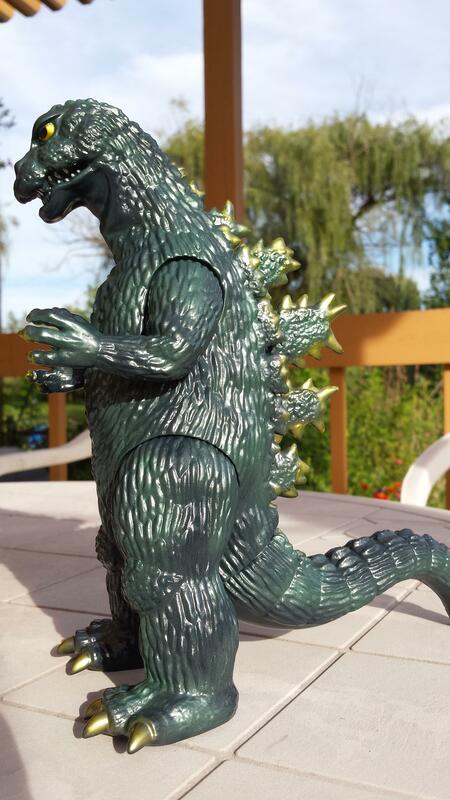 The sculpt does look great. Maybe I will snag this if I find one on sale. I've had box days nearly three days in a row now. 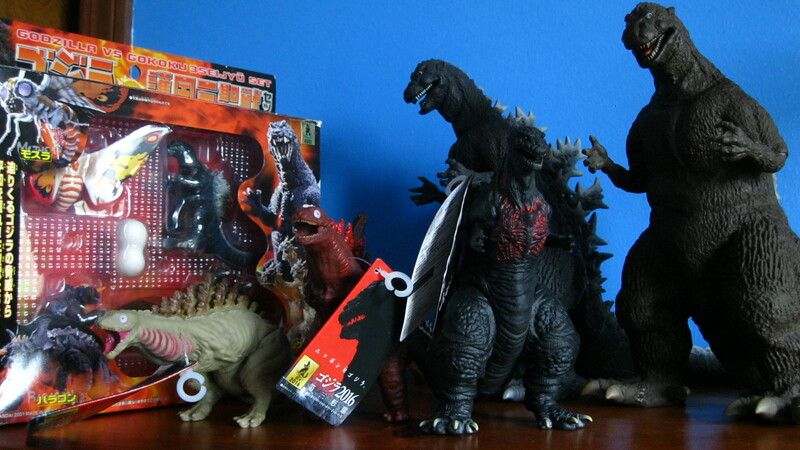 My Ultra monster collection has exploded as a result, but Godzilla and Gamera are spoken for, too! 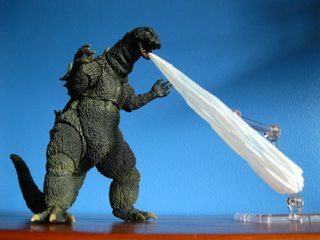 X-Plus Godzilla 1984. Marks my second X-Plus 30cm figure. 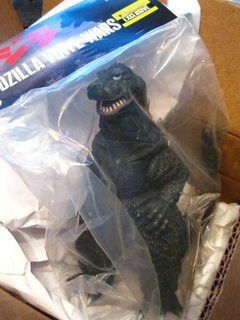 Also threw in a signed copy of issue 4 of Godzilla Oblivion because of a slight issue with shipping, which is an awesome bonus. Got from Vampire Robots, so use them. 'Kay!? 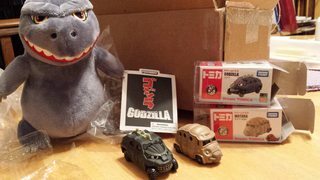 The Phunny Plush Godzilla and the Takara Tomy cars. 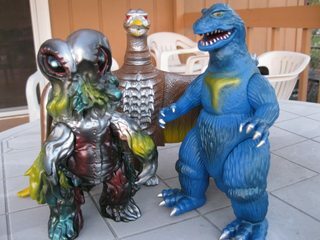 Three awesome Vinyl Wars stylized figures: Bear Model Hedorah, Marusan Rodan 1956, and Marmit Monster Heaven Godzilla 1962. 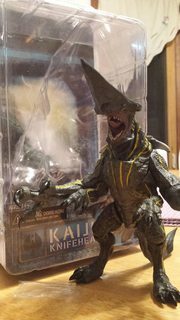 NECA's first Knifehead figure; looks nice alongside 6" vinyls and Tamashii figures. 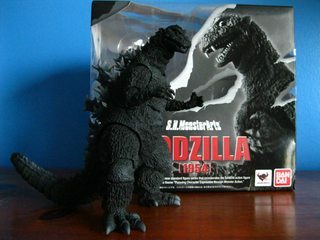 Godzilla 1964 Emergence - my first Monsterarts! 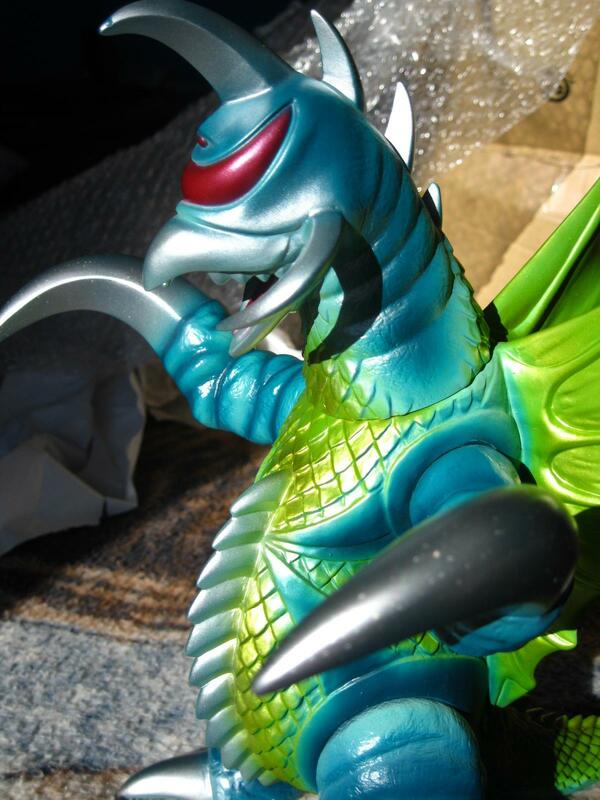 The 1991 release of the old Bandai Antlar vinyl - probably the oldest figure in my collection. 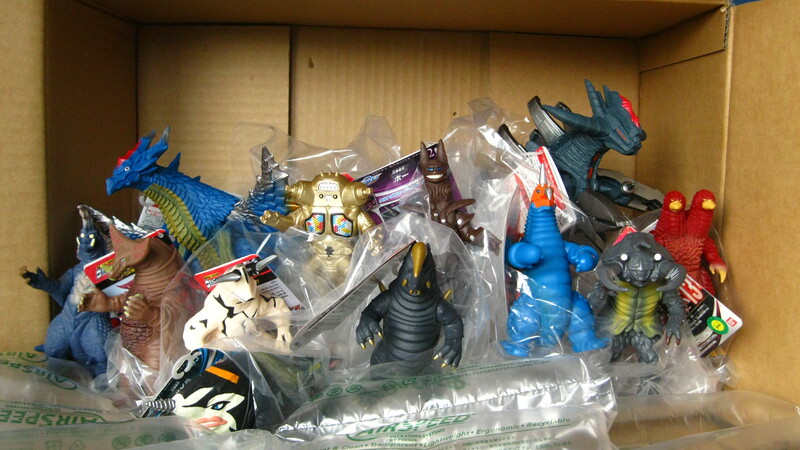 Big haul here - Gamera HG set 1, Battle Box Showa Ghidorah/Mothra larva, and S.H. 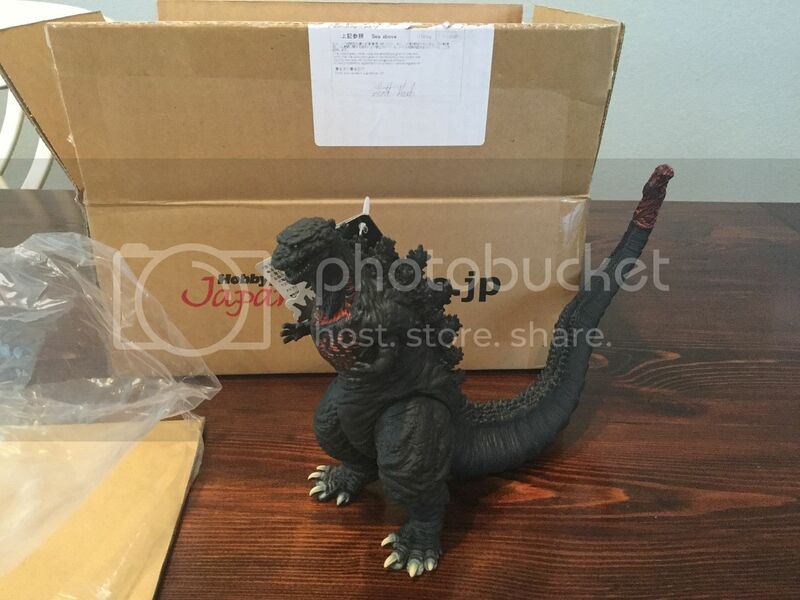 Monsterarts Godzilla Rebirth! 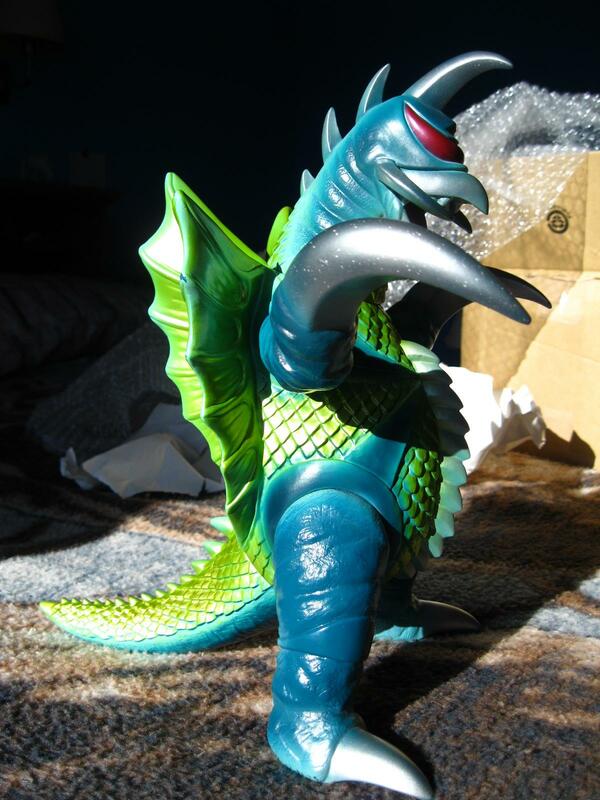 The Bandai 8" Gamera 1995. 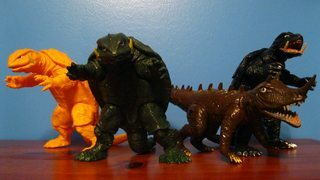 A bunch of Gamera HGs (and more), including the complete 3rd set! 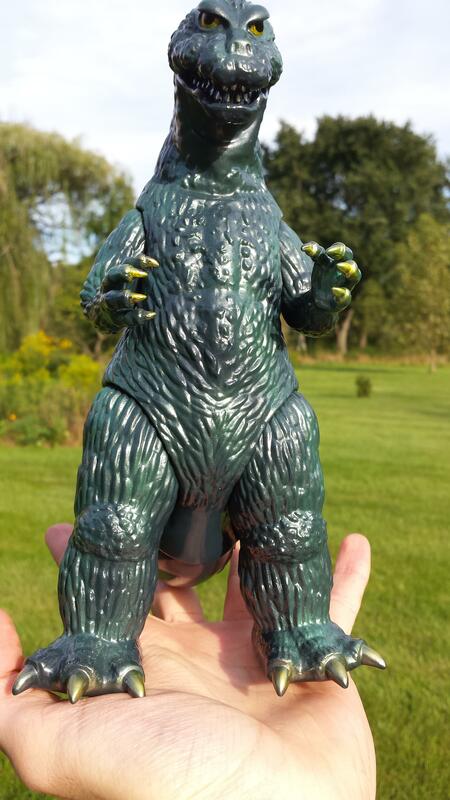 Another Vinyl Wars figure: Marmit's Semi-Real Godzilla 1962! 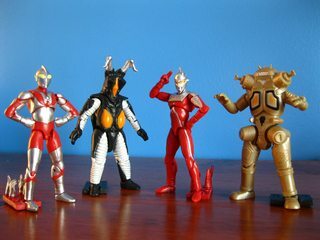 SHODO's complete Ultraman VS set. 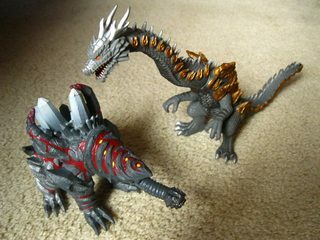 A couple more Ultra monster vinyls: Golgolem and Natsunomeryu. 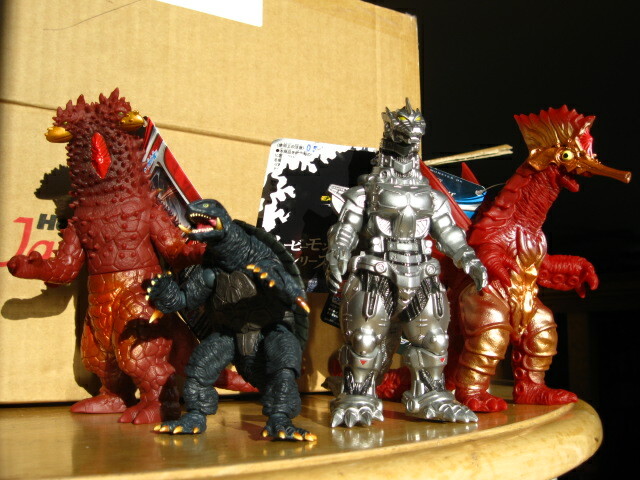 A nice set of X-Plus Gamera crane prize figures; first box day of the new year! 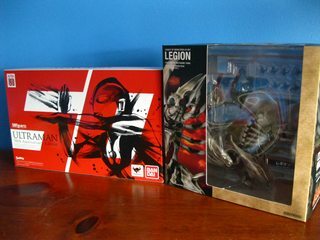 The first of two awesome arrivals from HobbyLink Japan: Legacy of Revoltech Legion and S.H. 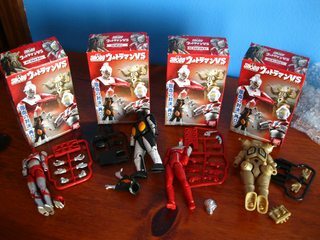 Figuarts Ultraman 50th Anniversary set! ...And the second box, just arrived yesterday: S.H. 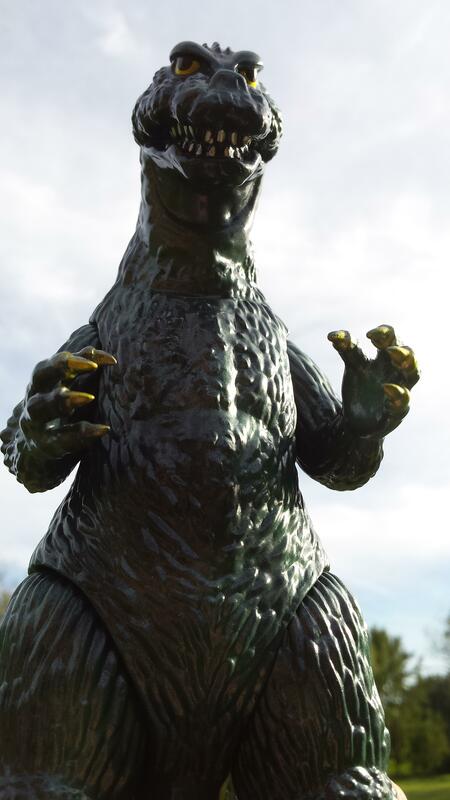 Monsterarts Godzilla 1954! I'm certain I more than doubled my colletion in the past few months. Last edited by Rody on Thu Jan 12, 2017 10:04 pm, edited 1 time in total. ^Talk about a centerpiece! 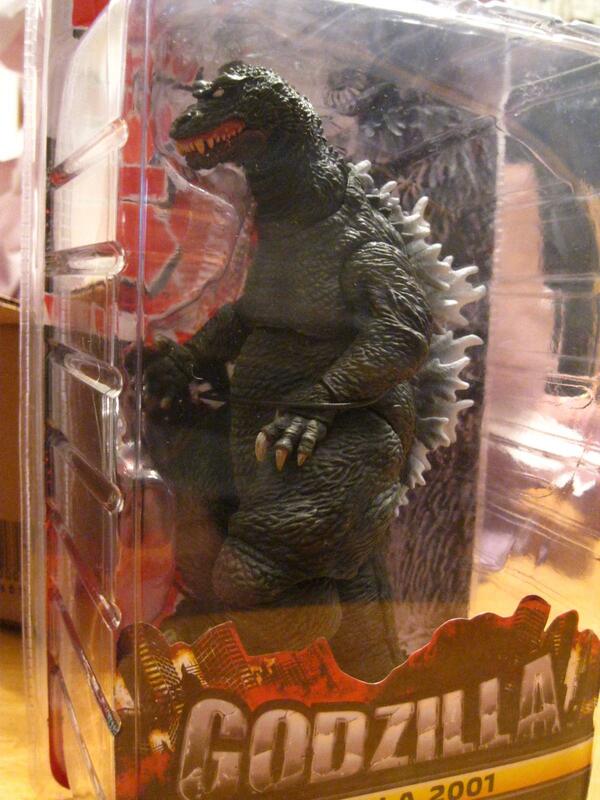 That is one magnificent figure. They're actually bigger than I expected! 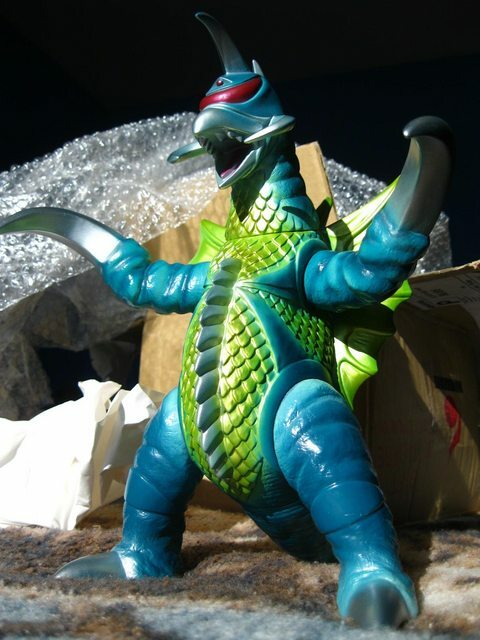 I also have a big Gigan vinyl coming in soon (by Solvi Life? Vinyl Wars reissued it); I'll post pictures when it arrives. 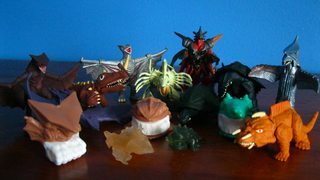 *I actually have some of the old Gamera crane prize figures X-plus did for SEGA years ago; not quite the same, though. 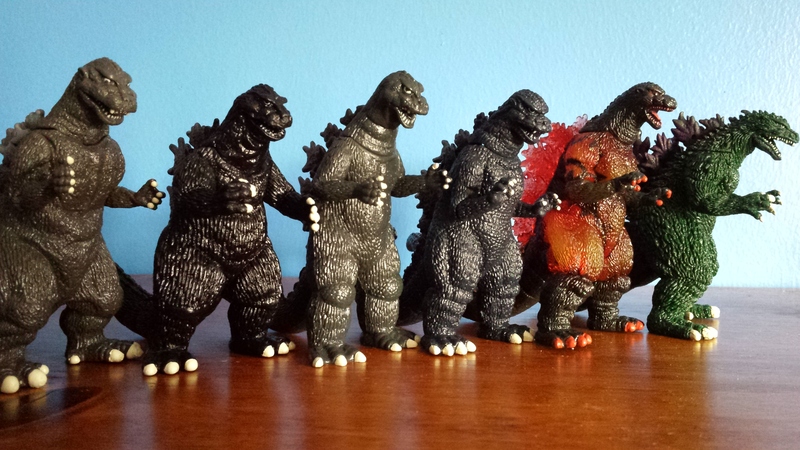 I wasn't exaggerating when I said "big" before: he stands 11.5 inches tall, dwarfing nearly every other figure in my collection!! ^Haha! Yeah, the blue variant is a real eye-grabber. 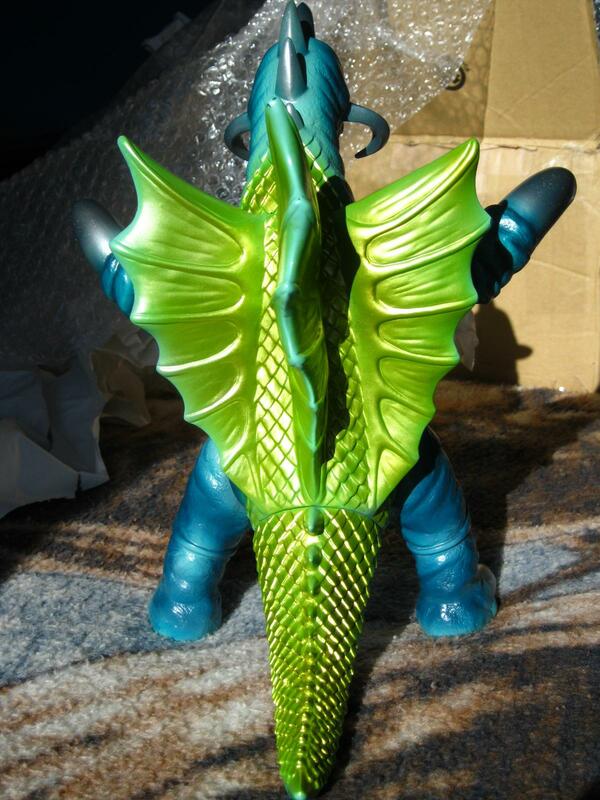 It's the Marmit Monster Heaven sculpt; I think this variant was reissued under the Vinyl Wars line. 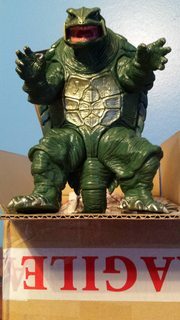 I found him for a great deal of $49.99 on eBay, almost by accident!